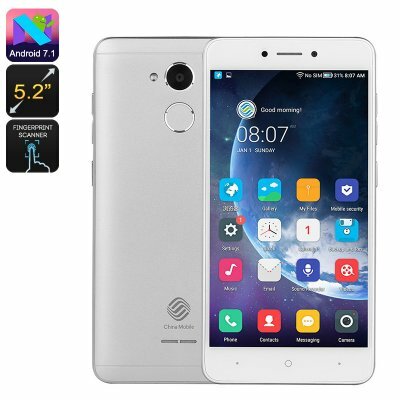 Successfully Added A3s Budget Smartphone - Snapdragon CPU, 2GB RAM, Dual SIM 4G, Android 7.1, 5.2 Inch HD Screen, Fingerprint Scanner (Silver) to your Shopping Cart. The A3s smartphone from China Mobile is one of the best 4G budget smartphones you're likely to find. This phone not only looks great but it works exceptionally well and offers everything you could hope for and more at an unbelievable price. The design is nice and clean with a 2.5D arc glass to the front and smooth beautiful edges. The rear of the phone features a fingerprint scanner as well as 8MP camera and LED light. To the front, you're greeted with a lush and colorful screen that has 720P resolutions and is respectably bright so you shouldn't have any problems viewing it even on sunny days. At just 146 grams and measuring 147x73x7mm this phone is easy to use with one hand and the sandblasted back offers a smooth yet graspable texture that helps you keep a secure grip. When it comes to hardware the A3s has a Snapdragon 425 processor and 2GB of RAM which is exceptionally welcome at this entry level cheap phone price point. You will also enjoy 16GB of onboard storage and there is an option to expand this with a micro SD card. Thanks to its performance efficient CPU and screen the 2800mAh battery last surprisingly well so you can have a full day of typical phone usage from just one charge. There are two SIM card slots available on the A3s (if you don't use a micro SD card) and they connect to a range of 2G, 3G and 4G bandwidths that support a good range of countries. An Android 7.1 interface is going to bring all the benefits of a sleek intuitive interface and make the phone easy to use even for the newly initiated smartphone users. The A3s Android phone comes with 12 months warranty, brought to you by the leader in electronic devices as well as wholesale cheap phones and cool gadgets.